Today 17 long years ago, the first prisoners were brought to Guantanamo. We are preparing this morning for the annual J11 rally at the White House amidst a full day of activity. We’ll send you a report on those events on the weekend. But now we’ll catch you up on Thursday’s work in DC. Richard Sroczynski and Jeremy Varon for WAT and representatives of Amnesty and CCR met with several House Democratic leaders to assure that closing Guantanamo was on their agenda and to try to provoke specifics in that direction. 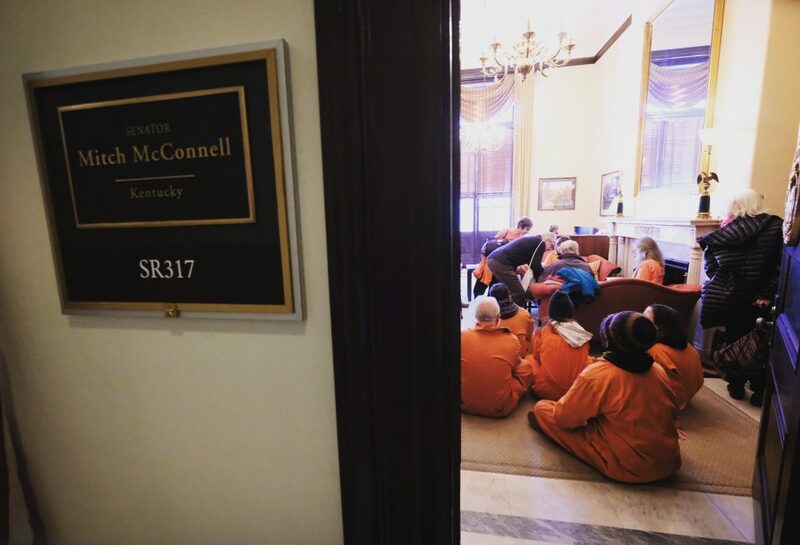 Pushing the envelope on advocacy a bit, 25 members of our community later converged on Sen. Mitch McConnell’s office for a sit-in, with demands concerning both Yemen and Guantanamo. Four were arrested when they stayed after the office closed. Read our press release about their action, demands, and arrests below. Activists call on McConnell to schedule a vote on the War Powers Act, allowing discussion in the Senate regarding the war on Yemen, and to fully support closure of Guantanamo prison. Four human rights activists were arrested today and charged with demonstrating inside the U.S. Capitol after sitting-in at the office of Senate Majority Leader Mitch McConnell. They were among a group of about twenty-five Witness Against Torture activists who entered the office at 3:00 p.m. Many were clad in orange jumpsuits resembling those worn by prisoners in Guantanamo. They delivered a letter requesting McConnell’s assistance on two matters concerning human rights violations. The letter asks him to “schedule a vote on the War Powers Act to end U.S. military involvement with Saudi Arabia and the United Arab Emirates in the terror attacks on the people of Yemen.” The letter also asks that he use his influence to close down the prison facilities at Guantanamo. Two of McConnell’s aides listened to the activists’ concerns for an hour. The four who were arrested had remained seated in a conference room inside the Senator’s office. 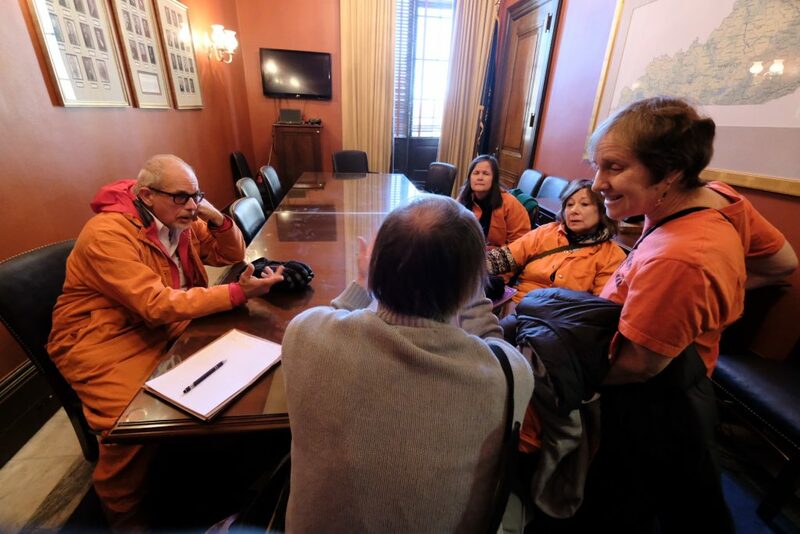 They said they were prepared to wait in McConnell’s office until he is able to meet with them and confirm that he will take action on a vote on the War Powers Act regarding Yemen and initiate a process to close down the prison at Guantanamo. 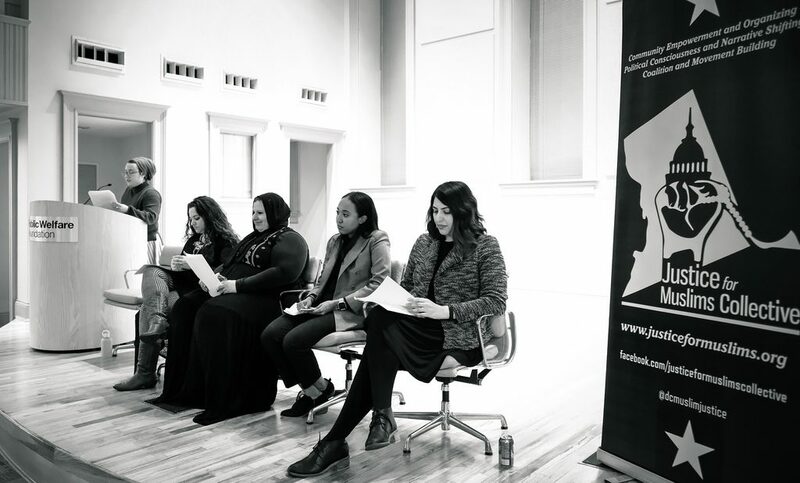 WAT joined Justice for Muslims Collective and several other organizations to sponsor a panel exploring the effects of the War on Terror on Muslims and the role of institutionalized Islamophobia as part and parcel of the post 9/11 national security apparatus. Delivering the keynote address was Dr. Maha Hilal with the Justice for Muslims Collective and WAT. Maha addressed the domestic/international connection which sets the standard for how Muslims are treated. She made a connection with “border imperialism” with its four components: 1) mass displacement of colonized people, 2) criminalization of migration, 3) entrenchment of racial hierarchy, and 4) state-mediated exploitation of migrant labor. In the panel which followed, Darakshan Raja (Justice for Muslims Collective) described how gendered Islamophobia escalates state violence on all levels. Attorney Aliya Hussain spoke about her work representing men at Guantanamo and the suit to release the prisoners that CCR filed last January 11. She reminded us that whatever reasons that have been given for the men’s detention, these reasons are no longer relevant. Aya Saed (CCR) discussed the particular problems experienced by Muslims who are black. She said that because the War on Terror has no regional or time limitations, children who are Muslim or black Muslim born post-9/11 are experiencing a great deal of psychological terror. A large crowd attended the panel, viewed reproductions of paintings by two men still detained in Guantanamo, and enjoyed Middle Eastern food and fellowship. (Fasters kept a respectful distance from the food!) Kudos to Maha for organizing this successful event. 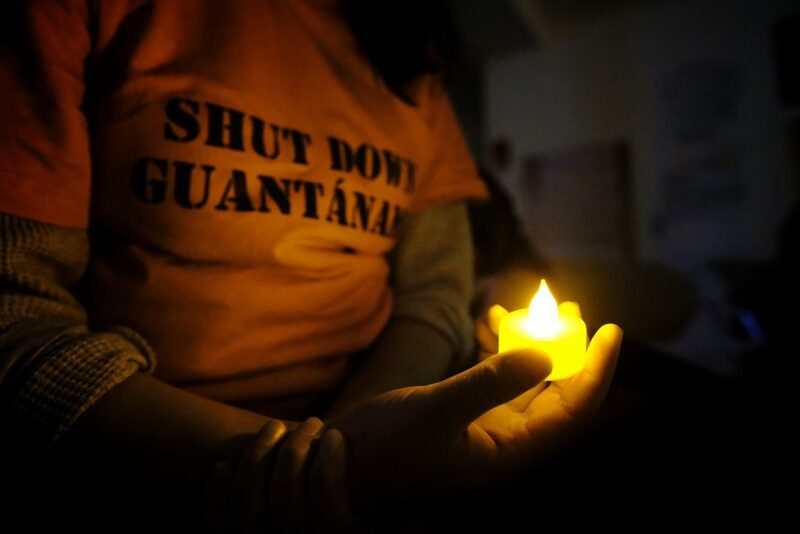 Morning circle on Friday: We centered ourselves, connecting our spirits to the men in Guantanamo on this sad day 17 years after the first men were imprisoned there. We reflected on what we hold onto in order to continue the work. The answers ranged from sorrow, grief, and loss to hope and faith, beauty of the earth, and the manifestation of the divine embodied in community. And so the day began. We’ll report back this weekend on how it unfolded.